Of those Mercs expected to run and hide, pole man Lewis Hamilton led from the launch but in the lengthy run to turn one his stable mate Nico Rosberg got in his draught and enacted a fine pass for the lead swooping around the outside of turn one. But almost before we could hand out plaudits all hell broke loose. 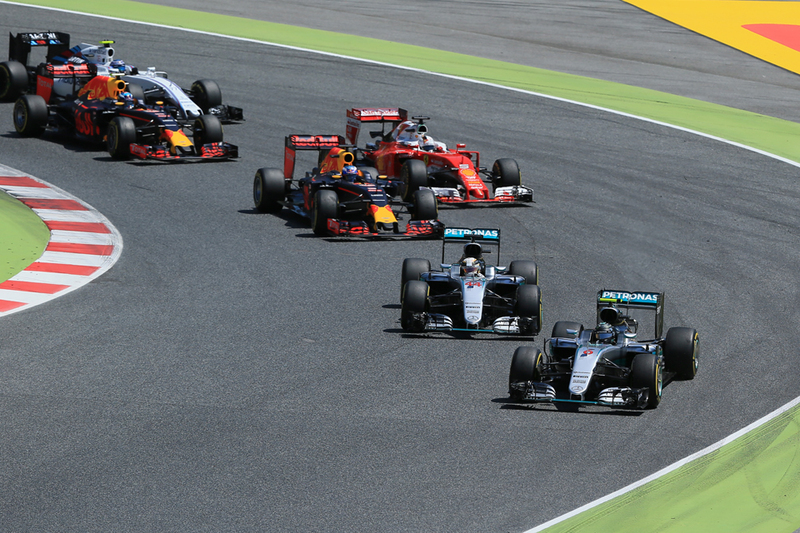 The synopsis is that Hamilton aimed for the inside of Rosberg in the run out of turn three into four. Rosberg sought to cover the inside and didn't leave room for a car. Hamilton ended up on the grass and, out of control, he collected up his team mate too. Scratch two Mercedes, beached and broken inauspiciously in the gravel trap outside of the turn. The imperious silver machines were all of a sudden not a factor. Such is the way of things there has been and will be plenty of unofficial inquests, and inevitable attempts to apportion blame. Yet even with the drama it genuinely looked to this writer like one of those things. Rosberg did block aggressively, which ordinarily is his right, the trouble is that by the time he did it this time Lewis's machine was already at least part alongside his. Lewis's defenders have pointed to the regs that suggest that if a significant part of the car, considered to be the front wing, is alongside then space must be afforded, and that seems undeniable. Niki Lauda among a few others suggested he was too aggressive. That struck me as harsh, as Lewis it seems was doing little other than try to lead a motor race. He wasn't timid but you wouldn't expect him to be. Yet the real culprit appeared to be a sheer speed differential between the two cars, which had a peculiar explanation. It later was revealed that Nico was in the wrong engine mode - which his team mate estimated had cost him 180bhp - and Lewis therefore was closing at some 17kph faster. Analysis of the on-board footage suggested that Nico was seeking to change his engine mode on his steering wheel just at the point Lewis launched his attack. This it seems explained Nico's surprise at Lewis's swift appearance on his right. As I said, one of those things. And the stewards agreed, by concluding that it was a racing incident with no further action for either pilot. While as it took Martin Brundle to point out, if you have two competitive and fairly well-matched racing drivers with the same equipment and who are permitted to race each other then this outcome will sometimes happen. The only way of ensuring otherwise is strict team orders and/or number one/number two status, which we don't want. As with most things you can't have your cake and eat it on that one. Thankfully too Mercedes boss Toto Wolff appeared to concur and confirmed that the team's policy will not be altered, as well as suggested similar perspective to Brundle in his words. "By continuing with the approach of letting them race it was clear that eventually this could happen" he said. "And we will continue to let them race...Today was just a couple of unfortunate coincidences that ended up in us losing as a team." We can be grateful that the shrill and excessive reaction after the previous notorious clash in Spa in 2014 does not look like it'll be repeated. And it left us with a Spanish Grand Prix demonstrating for real that occasionally-aired hypothetical of 'what would Grands Prix be like without the Mercs?' Daniel Ricciardo led from his new Red Bull team mate Max Verstappen, with the astonishing and fast-starting Carlos Sainz next, followed by the two Ferraris with Sebastian Vettel ahead. 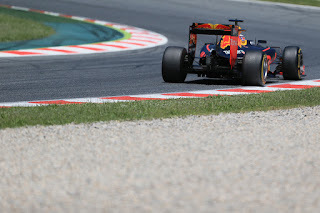 Incidentally Max had put in a fine move of his own before the Merc carnage ahead took all attention away, with a Fernando Alonso-esque pass of Vettel around the outside of the long turn three. The Ferraris cleared Sainz soon enough (incidentally, kudos to Sainz - the forgotten man somewhat of the recent Red Bull saga - putting in a fine drive to finish sixth), giving us a Red Bull vs. Ferrari set-to. From here it was typical Barcelona, in that overtaking is pretty much theoretical only, so it all became a matter of strategy. And this strategy battle became a scrappy one; one almost of attrition. There was plenty of shadow boxing; almost all of them pitted at a sub-optimum moment in reacting to another in order to maintain a place. And unusually it was the fall-back option of a two-stop strategy, that the Red Bull and Ferrari that followed their respective team mates were put onto, that proved the superior. Mercedes won't be the only one conducting inquests post hoc, as for the first time since 2014 Ferrari wasn't the one that picked up the pieces on a day that Mercedes compromised itself. 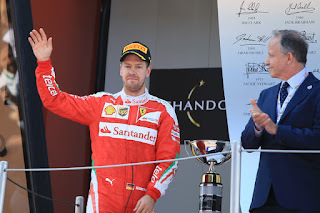 For much of the race's first half matters appeared to be in the palm of Sebastian Vettel's hand. Qualifying indeed was confirmed as an aberration and in the early part he looked the fastest out there. Also he did a much longer first stint than the Red Bulls and without losing much time, leaving him in third place stalking the Milton Keynes pair and with much fresher tyres on and therefore many more strategy options. It got a little better for him still when Verstappen appeared caught in a pincer movement mid-race when Ricciardo, seeking to anticipated Vettel's undercut, pitted for a second time on the early side, then Seb followed himself a lap later. I'm no strategist and things will come out in the wash presumably, but it was odd that Ferrari at that point in effect gave up Seb's tyre advantage. It got more odd when Seb pitted very early for his third and final time too, after a scant eight laps on that set, which seemed early to the point that some wondered whether perhaps Seb had a slow puncture. Seb confirmed not though after the race and that it was an attempt to get by Ricciardo, who was their sole focus at that point. 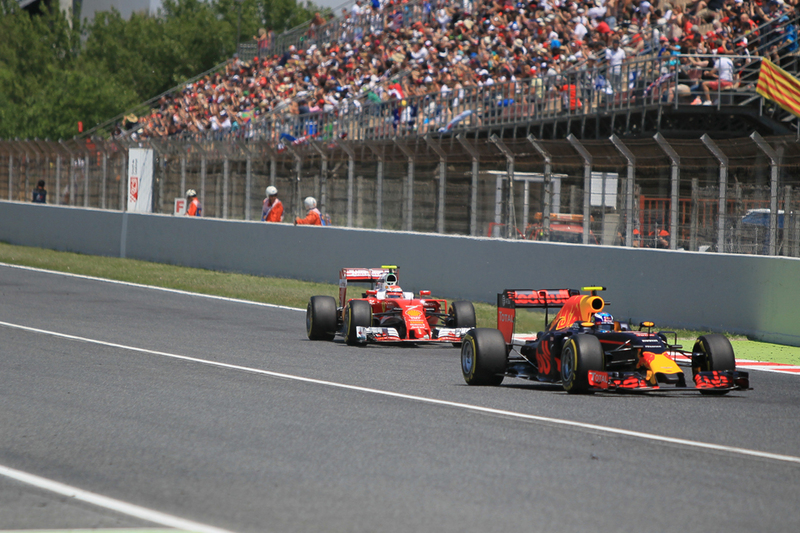 The possibly two-stopping (albeit a rather lopsided two-stop) Verstappen and Kimi Raikkonen were not a concern. 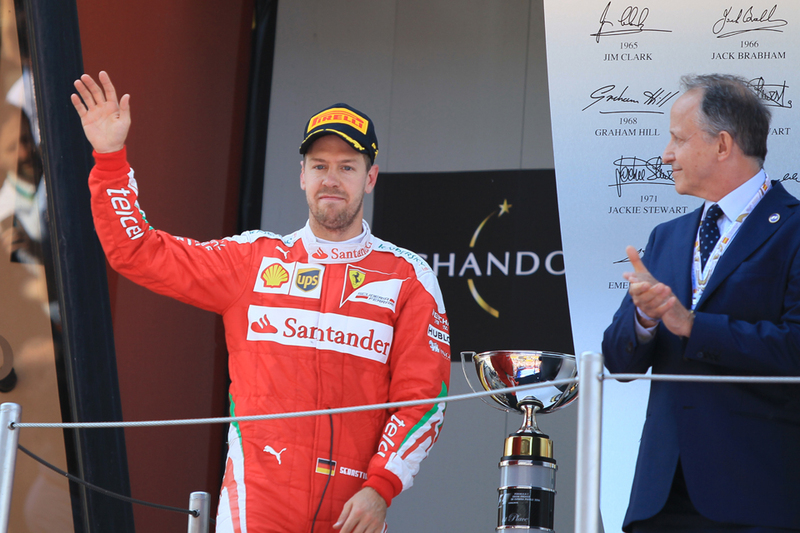 "We were surprised by how superior the two-stop was", mused Seb later. "I wasn't worried about Max at that point" he went on about the timing of his early final stop, "I was trying to attack the leader of the race which was Daniel, so I think at that point I was obviously going onto the soft tyre. 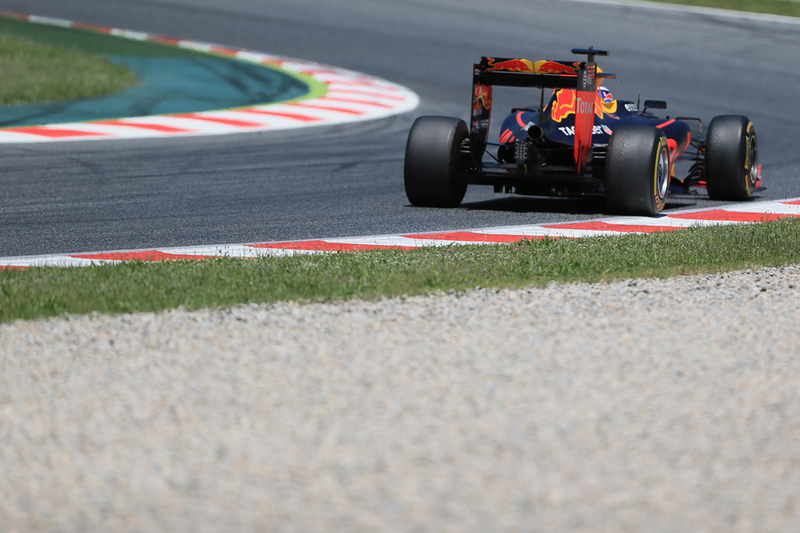 I committed to a three stop, Max then obviously - or Red Bull - had the opportunity to split their cars, they tried to cover with Daniel and obviously do the opposite with Max". It did get Seb ahead of Ricciardo when the Australian pitted himself eight laps later but it left him with overtaking to do, and perhaps more crucially hardly any benefit in tyre life over the pair he was chasing. All were on the medium compound (and all were running to the end presumably) and Seb's were just three laps fresher than Verstappen's and two laps fresher than Kimi's. Adding to this Seb confirmed too that his car was happier on the soft tyre than the medium, and what he did involved ditching the soft early and having a lengthy spell on the medium... Little wonder he only made modest impression on the two-stop pair ahead before the end, and followed them home a disappointing third. Both Vettel and Ricciardo indeed drew the short straw, and both lamented their lot afterwards, reckoning they'd have won with a two-stopper. But it is clear that both Red Bull and Ferrari were caught by surprise today. Teams splitting their strategy of course isn't new, but as noted today we had the unusual situation where the fall back option in practice turned out to be the better one. And he if anything seemed more peeved than Seb. "We were leading, it was there for us, Mercedes had their mistakes on lap one and the race was in our hands" he said. "And [then] we went to [a] three-stop strategy, we did [it] too late as well, Seb [had] already jumped us, so then not only I was required to pass Seb, I had to pass three cars when we know we are down on speed and it is a hard track to pass. "It didn't made sense, I thought at the time we did it because everyone else was going to do it but it's frustrating, I think we just threw the win away today....I don't understand why I was the one, normally the guy in the lead gets the better strategy, it didn't work out today." 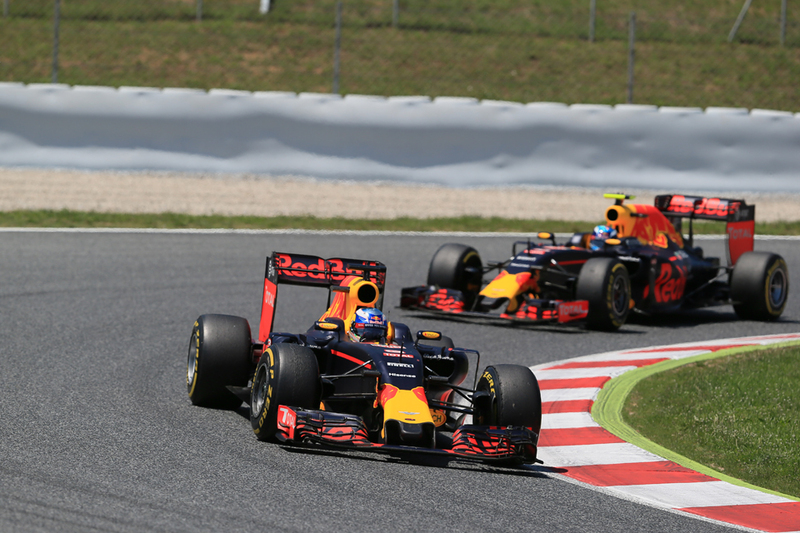 Verstappen and Kimi Raikkonen ended up on a two-stop strategy almost by accident it seemed. As mentioned Max almost was the forgotten man when Ricciardo and Vettel - the two expected to slug it out for the win - shadow boxed with their aggressively-timed second stops. It left Max apparently rather high and dry - bound to lose places whenever he pitted and when he did eventually pit five laps later it looked rather a neither-fish-not-fowl approach. Observers reckoned it was about five laps short for a comfortable two-stopper. Then adding to the curiosity Kimi followed him in just a lap later, apparently shadowing Max's strategy. Last they did though, as often seems to be the case these Pirellis hung on a bit longer than anticipated towards the end of a race. While Max gave absolutely nothing away to Kimi, never putting a wheel out of place and making sure he stayed out of his pursuer's range as they headed onto the main straight and only credible (if still remote) passing point. 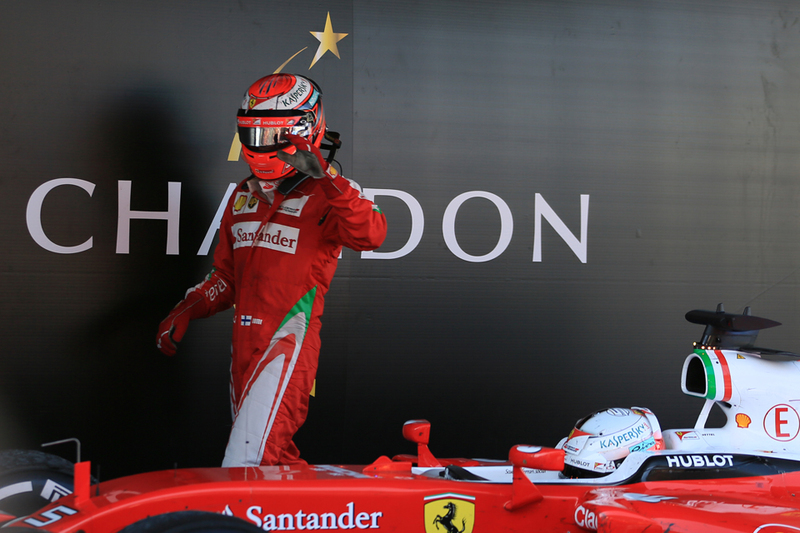 In hindsight, Kimi never really got so much as within distance to make a move. One could imagine Murray Walker eulogising on Max 'driving like the veteran he is not'. But even among these sort of cases his sheer assurance is scarcely credible, one taken from a top-notch performer several years older than him. Somehow it exists in a barely formed 18 year old youth. 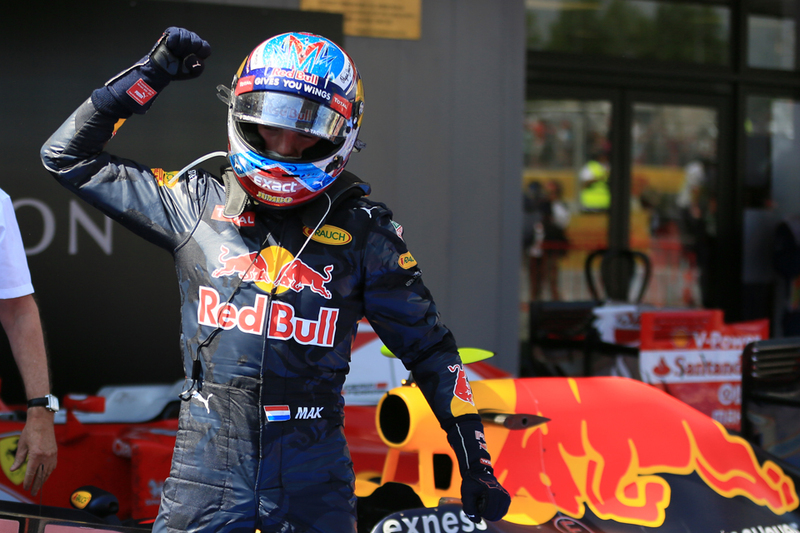 Max indeed won and with it took one of F1 history's most astonishing triumphs, and appropriately a few 'youngest driver to to do x' all-time records went his way at the same time. He isn't just the youngest winner but also the youngest to get onto a podium at all. And even out of the car in his moment of celebration there was hardly a hint of callow youth. He was pleased clearly, but also poised. Scarcely a sign of so much as a quivering bottom lip. Max's sheer assurance it seems is all-encompassing. "At the end I think we did the best strategy possible" he continued with sangfroid. "Especially in the last stint I got quite a bit of pressure from Kimi behind, but on this track it's quite difficult to overtake so for me it was a case of not making mistakes, no front locking, so that's what I tried to do and it worked." Kimi too was gracious about his young opponent. "We all know he is a good driver and he's in a good team now. When it comes to youngest and oldest, it happens to be like that. I raced against his father. That actually sounds even more scary. In F1! That's how it goes." While of course we'd concluded a while back that race wins, and titles, for Max was as close to a racing certainty as you're likely to find, no one anticipated it would be this soon, or under these circumstances. On his first race for the Red Bull big team, after the rancour around in his enforced swap with Daniil Kvyat between races. One too can only imagine what awaits him in his F1 career from here. Saying the sky is the limit doesn't really do it justice. F1 these days seems permanently in need of good news stories and today it got one. Indeed whatever else motorsport, and its pinnacle as represented by F1, is doing wrong - and many with justification think it's plenty - its ability to produce rounded, skilled and aggressive driving talent, honed at a much earlier age than before, is better than it has been in decades. 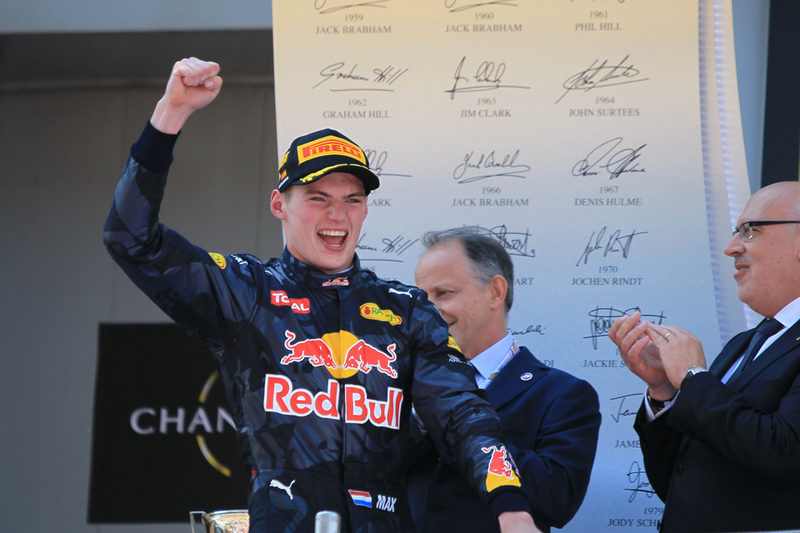 And of this young talent the clear standard bearer among them is Max Verstappen.